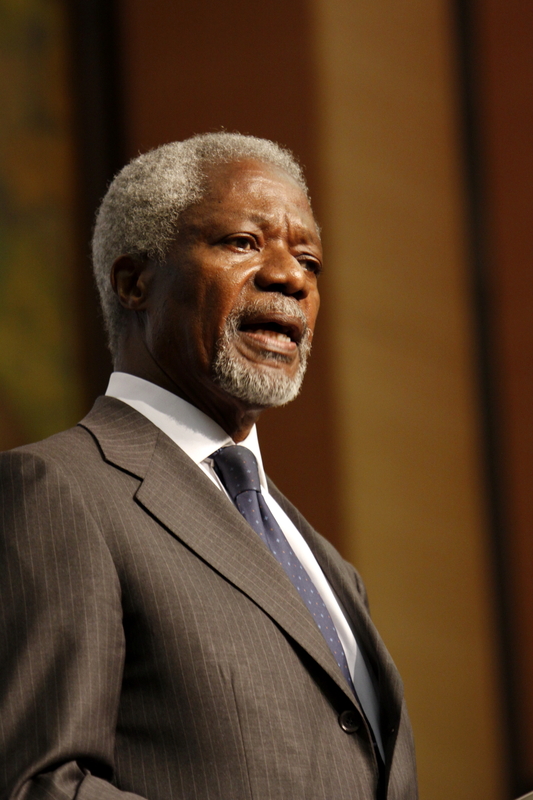 Kofi Annan gave the opening speech of a high-level conference jointly organised by the Kofi Annan Foundation, ICTJ and the African Union entitled “Truth Commissions and Peace Processes in Africa”. The conference’s foci are the critical issues that peace mediators and practitioners need to take into account when considering including a truth commission as part of a peace process. Excellences, Ladies and Gentlemen, first of all, allow me to thank Commissioner Smail Chergui and the African Union for making this conference possible. I sincerely thank as well the International Centre for Transitional Justice and its President David Tolbert for their great support in preparing this event. Over the past couple of decades, the international community and individual nations have struggled to find the right responses to the devastating legacies of mass atrocities and even genocide. In numerous cases, an important part of the response has been the establishment, in one form or another, of a truth commission. Truth seeking and reconciliation has now become an accepted, if not universal, feature of the architecture of post conflict peacebuilding. The number of truth commissions has grown rapidly. And Africa is the continent where the most truth commissions have been established: over 18 to-date, including the South Africa’s landmark Truth and Reconciliation Commission. But, as with all conventional practices, from time to time one should pause for reflection to ensure that those practices remain relevant and effective. Sharing, discussing and reflecting on the experiences gained on truth seeking and peace processes is therefore the aim of this conference. Ladies and Gentlemen, we all want peace. Nevertheless, we must recognize that peacebuilding is a complex process fraught with difficulties and dilemmas. There is often tension between what the parties at the negotiating table may decide and what victims demand. There is tension between the negotiators aiming for a settlement and those who want stringent accountability for all crimes committed. There is tension too between the duty to prosecute and the desire to end violence and move on. In sum, there is tension between peace and justice. I am often asked, should peace come before justice? From my own experience, I can say that we have learnt that justice is not an impediment to peace – it is an essential partner. Of course, the parallel pursuit of justice and peace does present testing challenges for peace-makers. My advice is that we must be ambitious enough to pursue both justice and peace, and wise enough to know when and how to do so. This usually means, we are looking for that narrow middle ground where compromise is possible for all parties. How can both justice and peace be achieved? How can violence be ended while accountability is ensured? How can we secure justice for victims? And how can political space open up for former adversaries? There are no simple or quick answers to these questions. Every conflict has its own, particular characteristics and peacemakers, as they craft peace agreements, need to carefully balance the elements. But to reiterate, I strongly believe that when we abandon justice to secure peace, we are most likely to get neither. Indeed, impunity can, and has, contributed to renewed conflict. There are critical moments in a peace process when principle and must be carefully weighted – but not to the detriment of justice. I recall that I instructed my representative at the Lomé peace talks on Sierra Leone in 1999 to enter a reserve on a clause in the peace agreement relating to amnesty. The United Nations could not accept a blanket amnesty as the clause stipulated. At the Special Court for Sierra Leone, some of the perpetrators later tried to hide behind that provision. Fortunately, the UN’s refusal to endorse the clause was an argument successfully used to refute the calls for exoneration by those accused and tried for war crimes. Ladies and Gentlemen, it is sometimes argued that to move forward after a conflict, past atrocities need to be put aside until such a time when the social fabric might be strong enough to deal with them. I agree that we cannot prescribe how individual nations and victims should deal with the past. But societies as a whole cannot build legitimate institutions grounded in the rule of law and respect for human rights if latent conflicts and bitterness about the past remain unaddressed. Victims are owed the right to the truth, however grim and appalling it may be. They also want justice. But most crucially they want to know that it will not happen again. One of most iconic early truth commissions, set up in Argentina in the early 80s famously used “Never Again” as the title of its report. Remember, however, that the Argentinian and other early commissions dealt with only one issue: the disappeared. Since those days, the mandate and reach of truth commissions have expanded quite dramatically. The gap between popular expectations and what can be realistically achieved by truth commissions has sometimes led to disappointment and indeed disillusionment with the peace process itself. One of the obvious lessons of experience, therefore, is that the mandates of truth commissions should not be overloaded nor open ended. Peacemakers should help the principals distinguish the desirable from the achievable. Ladies and gentlemen, so how should truth seeking figure in the complicated web of interests that underlie peace processes? Working together, ICTJ and my Foundation have reviewed many truth seeking experiences coming out of peace processes. And we are very happy to hold this conference under the auspices of the AU to share them with you. From our work so far, we have found that successful truth commissions have a number of common elements. I will mention four. At the outset, parties to a peace process have to be clear about why a truth commission is being established; clarity is vital to avoid later disappointment. Second, truth commissions must reflect local realities and not blindly follow a global template. Third, we should be aware that truth commissions are not a panacea for a divided society. A society divided by conflict does not suddenly emerge united when a peace agreement is signed. Nor can it be reconciled by a truth commission’s work alone. And finally a point which I cannot emphasize too strongly: good leadership is crucial for success. Too often we have witnessed truth seeking processes derailed because of inadequate leadership. Those who lead truth seeking efforts must be beyond reproach, known for their impartiality, integrity and competence. So what should truth commissions strive to achieve? They can establish the facts about past crimes; they can give victims a voice and a claim for effective redress; they can establish an authoritative narrative of the past; and they can propose measures to avoid the recurrence of human rights abuses. This last point is especially important but frequently overlooked. Truth seeking should, of course, help determine the accountability of individuals. But truth seeking is not only about individual responsibility; it’s also about society, about the state and its institutions. This is the truth that is needed for making changes to the system, learning from past failures so as to prevent future ones. Nevertheless, I would caution that truth seeking cannot substitute for criminal justice. Both are essential building blocks in the reformation of the state and the healing of societies riven by brutality. So too is reconciliation even though we should recognize that reconciliation is a long-term process, not an event. Rule of law and respect for human rights. There can be no long-term security without development, and there can be no long-term development without security. And no society can long remain prosperous without the rule of law and respect for human rights. Truth seeking is a way forward to that essential but often elusive goal. The work of a truth commission can allow a society to move forward based on a shared understanding of the past and a common vision for the future. I wish you every success in your discussions over the next two days and in your ambitions to shape a bright and peaceful future for our beloved continent.